An 11-year-old boy was stabbed on his first solo Muni ride on Tuesday evening “by an apparently homeless man in an unprovoked attack while riding home from school,” Matier and Ross reports in SFGate. This story stopped me in my tracks – I’m sure this is every parent’s nightmare, and it happened on the 49, which I take more than any other line. The boy had been in the intensive care unit at SF General for stabbing wounds to his liver and stomach, but he’s since been listed in good condition, SFGate reports. The boy was riding home alone from baseball practice after school at the time, police spokeswoman Sgt. Lyn Tomioka said. 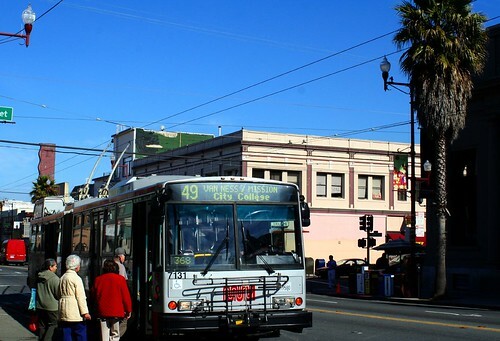 At about 6 p.m., as the bus neared 19th and Mission streets, a man described as “scruffy-looking” and possibly homeless attacked him at the back of the bus, stabbing him once, according to Tomioka. She said the boy was sitting with a balloon on his lap at the time. “It was an unprovoked attack on an innocent child,” she said, adding that there had been no conversation between the boy and the suspect, and no altercation between the suspect and anyone else on the bus, leading up to the attack. Surveillance video on this particular bus was not functioning at the time of the attack, according to media reports. The boy’s mother told Matier and Ross that “Muni is very dangerous.” I hate thinking that our daily transportation – the only transit option for many of us – is an unsafe place to be. But the horror that happened to this boy and the violent stories that we’ve received in the past leave me feeling that maybe our buses aren’t as safe as they should be. Back in March, we learned that SFPD billed Muni a cool $12 million to “provide police services” and fund traffic enforcement. Eve Batey at the SFAppeal published an excellent report detailing what the SFPD is supposed to be doing on Muni. Would it have helped if we really saw cops regularly on the bus? Has it really come to this? The police are working on a composite sketch of the attacker. Meanwhile, witnesses are asked to call police at (415) 575-4444 or text 84741, then typing “SFPD” and the tip.